If you've ever seen a school of clown loaches, it's hard to resist bringing a couple of them home. It's even harder to imagine that this beautiful fish is eaten as food fish in Indonesia and Borneo, where it grows to over a foot in length. Fortunately for the clown loach, among aquarium enthusiasts, it's a staple in the community tank rather than on the dining table. 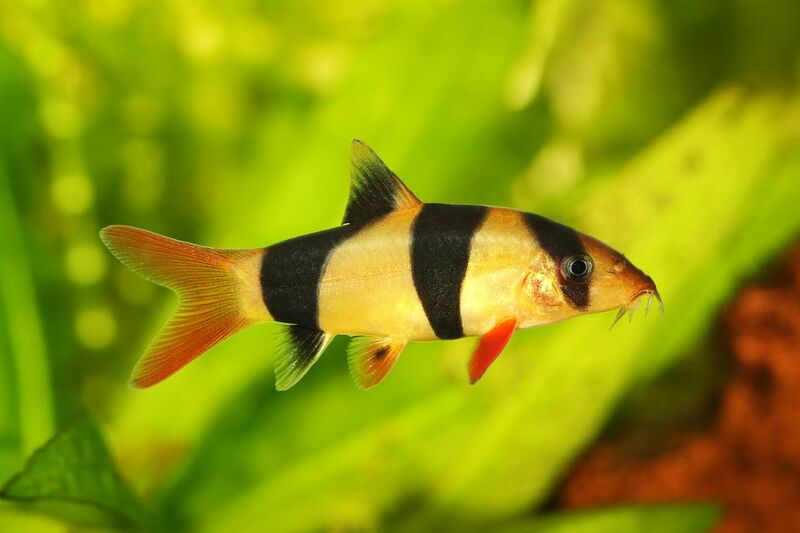 Its orange and black striped body, red fins, and active behavior has made it one of the most popular loaches. The clown loach is a favorite for freshwater hobbyists. It is a peaceful fish and coexists well with nearly any tankmate. It is also an amusing species to watch and feed as it's active during the day. They also eat those annoying snails that can wind up in your aquarium. The Clown Loach is sometimes called a scaleless fish, but it actually does have small scales embedded in its skin. The Clown Loach hails from the rivers and tributaries of Malaysia, Borneo, Sumatra, and Kalimantan. During spawning periods, they migrate to flooded areas of the rainforest where soft water the color of tea flows through boggy, slow-moving streams. This loach prefers waterways that are slow-moving shaded by leafy plants and lined with plant detritus such as fallen leaves, twigs, and plants. Like all loaches, the Clown Loach has a long, pointed nose surrounded by sensitive whisker-like barbels and a sharp defensive spine beneath each eye. These spines are used for defense; in captivity, they may prick fingers snag on nets, so it's important to be careful when handling your pet. The Clown Loach's arched body is long and lean, ideal for cutting through the water. True to its name, its body is bright orangey-yellow, and its fins and tail are bright red. It has wide black V-shaped stripes along the sides of its body and a third black stripe running vertically through its eye. Peaceful with its own and other species, it prefers to have companions with which it will form a school. Virtually all non-aggressive fish are suitable as tankmates for clown loaches. Because they prefer to live in schools, it's wise to keep three or more in a group. They don't like bright light and will hide among plants or rocks as well as sleep in holes, caves and other hiding places. Clown Loaches are large schooling fish, and they are quite active. That means you will need a large tank with plenty of space for your pets to move around. At the same time, however, each Loach should have several hiding spots available; Loaches love enclosed spaces and will sometimes "hide" in caves, tubes, and other hidey-holes. Unlike many loaches who are only active at night, the Clown Loach can be active during the daytime hours—though it's likely to be liveliest in the early morning and after dark. To watch your loach at play during waking hours, consider installing a blue "moonlight" tube or another form of bluish lighting, which will encourage your pet to come out to play. Water quality is critical for keeping clown loaches healthy. Take care to keep the water very clean, well aerated and warm; an efficient filtration system and frequent water changes are critical. Tank lighting should be subdued, and the substrate should be soft and sandy. Clown Loaches appreciate plenty of hiding places which can be made of wood or rock; strong, sturdy plants are also a good addition. Clowns will accept a wide variety of dry and live foods, but their preference is for live foods, especially worms. You can even earthworms to them, as long as you harvest the worms from soil that hasn't been fertilized recently. Ideally, you should feed them several small meals throughout the day. Loaches are particularly prone to Ich infections; watch them closely whenever new fish or plants are added to the tank. In the unfortunate event that an infection does occur, keep in mind that loaches, like catfish, are very sensitive to some medications. Often dosages must be cut in half to be safe. Read product information carefully before treating your loach. Males can be identified by the tail, which is larger and hooks inward rather than pointing straight out from the body. Females are smaller and more slender. There are very few documented cases of clown loaches breeding in captivity. As a result, very little information is known about their breeding needs. Clown Loaches rarely or never breed in captivity. If a female does spawn in an aquarium setting, there is an excellent chance that they will not be fertilized and that she or her male counterparts will eat the eggs before they hatch. Virtually all Clown Loaches sold for aquaria are captured in the wild. It's important, when buying Clown Loaches, to select only those with bright colors and to wait until the fish are at least a couple of inches long (they are quite fragile in their earliest days). At the store, look carefully at the tank to be sure it is well kept and that the fish seem comfortable and healthy. If you see any dead fish, steer clear: there is a good chance you'll be buying a loach that's already infected with Ich. If you're not quite sure which fish are right for your aquarium, check out all of our other freshwater pet fish breed profiles.